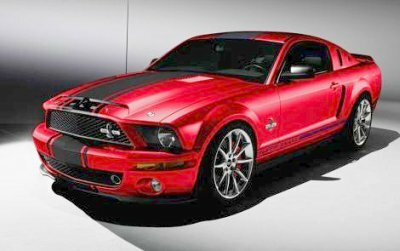 The base price (US) for the 2010 Mustang Super Snake is the combination of the cost of the 2010 GT500 plus an additional $29,495- approx. $33,495. What this kind of money gets you, is going to make you smile. Exclusive Shelby Super Snake hood, carbon fiber front fascia,carbon fiber rocker covers, carbon fiber mirror covers, throwback Shelby rear 1/4 window scoops, sequential tail lights,Super Snake badging, striping and lettering, front and rear brake ducting,and on the convertibles, a light bar with a solenoid activated brake light. Engine dress kit with billet caps, and engine accents. Upgraded supercharger with an output of some 630 to 750 horsepower with up to 710 lbs of torque for the big supercharger, cold air intake, borla cat back exhaust system coupled to a 6 speed transmission and a 3.73:1 rear end. 0-60 times of 4.1 seconds and a 12 second quarter mile are limited by the severe lack of traction in the first 3 gears. Wonder what a good set of wrinkle wall slicks and wheelie bars could do? Some how, mileage even at that stratospheric horsepower is decent for a car like this, at 13 city and 19 highway. Suspension and steering: Ford Racing suspension with adjustable dampers and thicker sway bars, Shelby/Baer six piston caliper braking system featuring cross drilled and vented discs, along with a Ford Racing short throw shifter. 20" Shelby/ Alcoa wheels shod with high performance Pirelli P-Zero Nero 255/30ZR20 on the front and 275/35ZR20 on the rear. Want to win a brand new customized 2011 Ford Mustang GT with its awesome 412 horsepower V8? Don't miss this! Here's a link to all the details of the Mustang 5.0 Fever Sweepstakes and how to enter.